Prophet Muhammad (peace be upon him – pbuh) is the perfect example for us to follow in all aspects of our lives. Allah (glory to Him, the Exalted, subhanahu wa ta’ala – SWT) tells us in the Holy Quran: “You have indeed in the Messenger of Allah a beautiful example [of conduct] for anyone whose hope is in Allah and the final Day, and remembers Allah much” (33:21). There is no better source to draw on for guidance when it comes to one of the closest and most intimate relations one has: balancing the rights and responsibilities of being a spouse. But having a role model to follow in this aspect of our lives makes it easier to tread this path which has happy times as well as challenges that can prove to be a real test of our faith. It is interesting to observe how Khadija (R), who had been with him for 15 years, attests to his immaculate character. A wife is one who knows her husband the most intimately, and naturally has seen the best and the worst sides of his personality. The fact that Khadija had such a high opinion of her husband, detailing for him his excellent traits in order to assure him that he was not deluded or being misled by the revelation experience, attests to the genuineness of Prophet Muhammad’s character. He was good to his wives just like he was good to those outside his home. A question worth asking ourselves is whether our spouses would have similarly high opinions of us. The Prophet (pbuh) was a loving and caring husband and did not hesitate to carry out little acts of kindness that showed his affection toward his wives. Many men find it awkward to extend themselves with simple and affectionate gestures, or they think they are too busy or overwhelmed with responsibilities to be romantic and loving toward their wives. Likewise, there are women who dismiss the importance of everyday gestures of affection toward their husbands. Who had more responsibilities in his life than Prophet Muhammad (pbuh)? Yet he made the time to be thoughtful, loving, caring, and romantic with his wives. Ayesha (R) is reported to have said that Prophet Muhammad (pbuh) would often eat and drink from the same spot on a vessel or bone as her, to show his love. She said: “I would drink then I would hand it [the vessel] to the Prophet (pbuh) and he would put his mouth where mine had been and drink; and I would eat the meat from a bone and he would put his mouth where mine had been” (reported in Muslim). 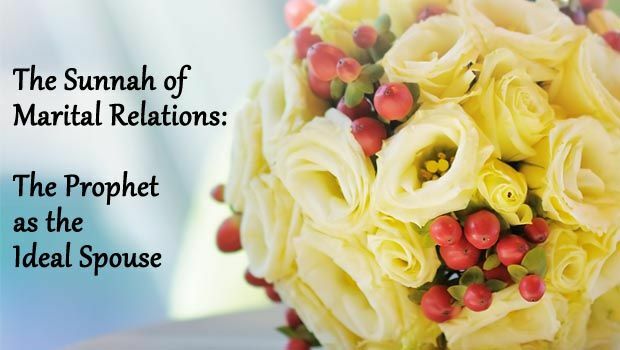 Ayesha (R) also informs us about a number of other simple acts of love and affection that the Prophet (pbuh) would do on a regular basis. Examples include laying in her lap (Muslim), kissing her (Muslim), asking her to groom his hair (Muslim), and going for a walk with her in the evening (Bukhari). Prophet Muhammad (pbuh) also did not hesitate to declare his love for his wife in public. While many men find it awkward to do so, the Prophet (pbuh) did not. Amr Bin al-As (R) reported that he asked the Messenger (pbuh): “O Allah’s Messenger! Who is the most beloved to you among the people?” He replied; “Ayesha (R).” He asked: “And from among the men?” He replied, “Her father” (Bukhari and Muslim). The Prophet (pbuh) exemplified the perfect character of a spouse who follows the guidance of Allah (SWT). He is reported to have said: “The best of you is the best to his wife and I am the best to my wife” (At-Tirmidhi and Ibn Majah). Prophet Muhammad (pbuh) also expressed his love to his wives in unique ways. Ayesha (R) would often ask the Prophet (pbuh), “How is your love for me?” The Prophet (pbuh) would reply, “Like the rope’s knot” (meaning that it was strong and secure). She would often ask after that, “How is that knot?” and he would reply “The same as ever” (reported in Hiya al Awliya). Prophet Muhammad (pbuh) would spend his time at home with his wives when he was not engaged in Islamic dawah or the governance and guidance of the community. He would participate in the domestic chores and be ready and willing to serve family members. Al-Aswad reported that he asked Ayesha (R): “What did the Prophet (pbuh) do at home?” She said: “He used to be at the service of his family; and when it was time for prayer, he would go out to pray” (Bukhari). Ayesha (R) is also reported to have said in another narration: “He acted like other men. He would mend his clothes, milk his goat, and serve himself” (Ahmad and Bukhari). The Prophet (pbuh) would also console his wives in public when they were upset. Safiyyah Bint Huyyiy (R) narrated: “The Messenger of Allah (pbuh) went to Hajj with his wives. On the way my camel knelt down as it was the weakest among all the other camels, and so I wept. The Prophet came to me and wiped away my tears with his robe and hands. The more he asked me not to weep, the more I went on weeping” (Ahmad). The Prophet (pbuh) did not get embarrassed, angry, or impatient. He just reassured her and compassionately wiped away her tears. The Messenger of Allah (pbuh) was distinctly kind and considerate to his wives in public. Anas ibn Malik narrates: “I saw the Prophet (pbuh) making for her [Safiyyah] a kind of cushion with his cloak behind him [on his camel]. He then sat beside his camel and put his knee for Safiyyah to put her foot on, in order to ride [on the camel]” (Bukhari). Prophet Muhammad (pbuh) used to laugh with his wives, entertain them, and play with them. He raced with his wife Ayesha (R) and teased her after beating her in one race. Ayesha (R) reports that the Messenger said to her: “Come I will race you.” She continues, “So I raced with him and I won. After I became heavier, he raced me and he won, so he laughed and said this one for that one” (Abu Dawood). In another narration, Ayesha (R) said: “It was the day of ‘Id, and the Black people were playing with shields and spears; so either I requested the Prophet (pbuh) or he asked me whether I would like to see the display. I replied in the affirmative. Then the Prophet (pbuh) made me stand next to him and my cheek was touching his cheek and he was saying, ‘Carry on! O Bani Arfida,’ till I got tired. The Prophet (pbuh) asked me, ‘Are you satisfied [is that sufficient for you]?’ I replied in the affirmative and he told me to leave” (Bukhari). The Messenger (pbuh) is reported to have said: “Everything that does not involve remembrance of Allah is futile, senseless, and wasted – except for four acts: a man entertaining his wife, a man training his horse, a man walking between the two posts [when practicing archery], and teaching swimming to another man” (reported in an-Nasai). How many men today are playful and enjoy simple fun with their wives? How many consider laughing with them and entertaining them a form of ibadah because it is following the Sunnah? Indeed, if we all followed Islam in its true essence, life would be a lot easier and our relations much more beautiful. The Prophet (pbuh) would talk to his wives when something was bothering him and he would consult them for advice in important matters. Seeking the advice of his wives or talking to them about official matters was certainly not gratuitous or done to appease them. That was not the way of the Prophet. On the day of Hudaibiya, for example, the Prophet (pbuh) signed a treaty with the pagans of Makkah which included the provision that the Muslims must leave without performing pilgrimage that year. The Muslims who had come prepared in the state of ihram were angry and were reluctant to abide by this condition and did not follow Prophet Muhammad’s (pbuh) orders to sacrifice their animals and shave their heads. The Prophet (pbuh) was distressed and went to his wife, Umm Salamah, to relate the situation to her. She advised him to conduct these rights himself first and that his companions would follow upon seeing him do so. The Prophet (pbuh) acted on this advice and his companions followed, just as Umm Salamah had predicted. This shows us that the Prophetic Sunnah of consultation certainly includes consulting one’s wife. Marital relationships are some of the most vulnerable relationships and conflicts are bound to happen. It is how these conflicts are managed that fortifies or weakens the marriage bond. Prophet Muhammad (pbuh) was one of the most patient husbands when it came to marital conflicts. Like any other couple, he and his wives would have their arguments and disagreements, but the way these conflicts were managed provides us with a beautiful example to follow. Anas and Umm Salamah (R) reported that once the Prophet (pbuh) was in Ayesha’s (R) house with some of his companions and Umm Salamah sent to him a plate of food. When Ayesha (R) saw it, she took a rock the size of a hand and hit the plate with it, breaking it into two pieces. The Prophet (pbuh) gathered the plate’s parts and told his companions, “Eat – your mother was overcome with jealousy; eat – your mother was overcome with jealousy!” So they ate. The Prophet (pbuh) then kept the broken plate in Ayesha’s house, sent a good plate of hers, with food, to Umm Salamah, and said: “A comparable plate for a [damaged] plate and comparable food for [ruined] food” (reported in An-Nasai and Ibn Majah). He (pbuh) dealt with this patiently instead of getting angry himself. The Prophet was very understanding of his wives’ feelings and moods and dealt with that in a light and easygoing manner. Ayesha (R) said that one day Allah’s Messenger (pbuh) said to her: “Indeed, I know when you are pleased with me, and when you are angry: When you are pleased with me you say [while making an oath], “No, by the Lord of Muhammad.” And when you are angry with me you say, “No, by the Lord of Ibrahim.” She replied: “Yes indeed, by Allah, O Allah’s Messenger! I do not abandon [when angry] except your name” (Bukhari, Muslim and Ahmad). Prophet Muhammad (pbuh) is also reported to have said: “Let not a believing man hate a believing woman; if he dislikes one of her traits, he would be pleased by others. (Muslim and Ahmad). He (pbuh) never hit any of his wives nor did he ever verbally or emotionally abuse them. Ayesha (R) reported: “Never did Allah’s Messenger (pbuh) hit with his hand a woman, a servant, or anyone else – except during fighting for Allah’s cause” (reported by Muslim). The Prophet (pbuh) is reported to have said: “A true believer is not involved in taunting, or frequently cursing [others] or in indecency or abusing” (Tirmidhi). If we were to follow the example of Prophet Muhammad (pbuh), our marital relations would be a lot more beautiful and peaceful. Many couples acknowledge the evil of abuse, but fall into the trap of verbal and emotional abuse. Constant taunting, cursing, and demeaning language become the norm and over time, the relationship suffers greatly. The way to break out of this cycle of abuse is first of all to understand that Islam enjoins believers to speak virtuous words or remain silent, and to absolutely practice restraint from taunting, cursing, or any sort of verbal abuse. We must be utterly conscious of the words we say to our spouse, constantly reminding ourselves of the grave consequences of negative, harmful words. There are instances when a marriage relationship seems simply unworkable or beyond repair. In such a situation, Islam allows for divorce. But even when it comes to divorce, Islam encourages good conduct. Allah (SWT) says in the Quran: “…Retain them in kindness or release them in kindness. But do not retain them to hurt them so that you transgress [the limits]. If anyone does that, he wrongs his own soul. Do not take God’s instructions as a jest” (Quran 2:231). The Prophet (pbuh) provided us an excellent model to follow to beautify our marital relationships. If we give these sunnahs as much importance as we give to the sunnahs of prayer and fasting, we could alleviate much suffering, and strengthen the ummah with the formidable building blocks of strong and happy families. Naureen Aqueel Naureen Aqueel lives in Ottawa, Canada. She is a free lance writer and previously a journalist and subeditor in Pakistan.